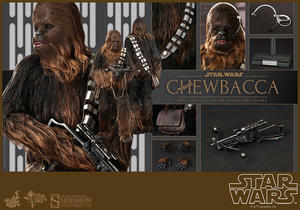 Hot Toys fans can expect to see a large collection of high-end collectibles from the iconic Star Wars saga coming soon! 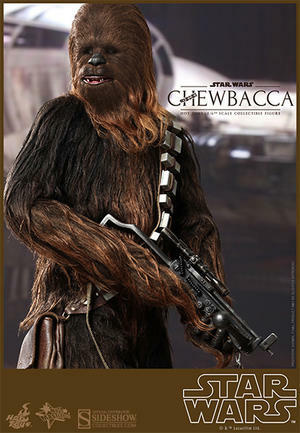 With Hot Toys’ acquisition of the right to manufacture collectibles for the Star Wars universe and the official reveal of the 1/6th scale Han Solo Collectible Figure, we wouldn’t forget about Han Solo’s trusty sidekick, the legendary Wookiee – Chewbacca. 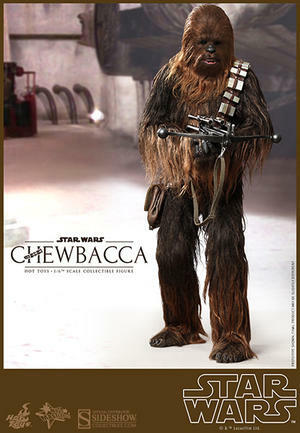 Many Star Wars fans have been longing for a high quality Chewbacca collectible figure and today, we are proud to present the highly-detailed Star Wars: Episode IV A New Hope : Chewbacca Sixth Scale Collectible Figure! 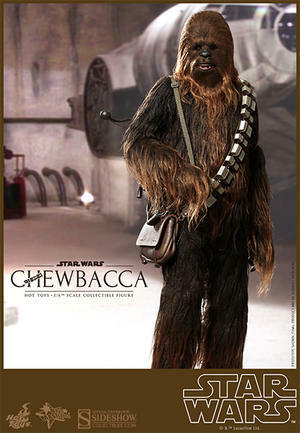 The movie-accurate collectible figure is specially crafted based on the image of Chewbacca in the film and features a newly developed body, brown fabric hair throughout the whole body that captures Chewbacca’s unique appearance, highly detailed bowcaster and accessory, and a specially designed figure stand. Star Wars fans shouldn’t pass up the chance to pre-order this incredible one-of-a-kind collectible figure, and don’t forget to add Chewie’s partner, Han Solo, to your collection!